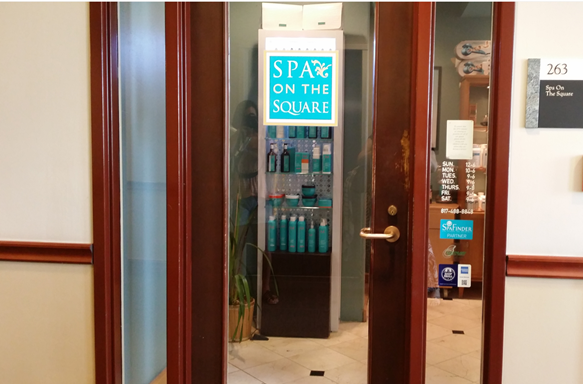 The other day I got to go to Spa On The Square in Southlake, TX and I had a great time. I wasn’t sure what to expect, honestly. 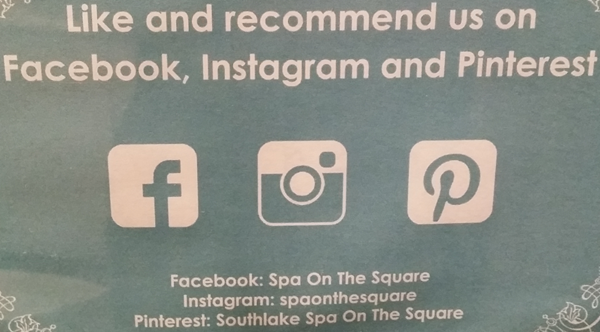 I don’t know anything about Southlake and was fascinated with “the square”. I have lived in small towns before with town squares that were built up nicely with shops and restaurants run by local business owners. They were always quaint and fun to visit. This was much like that, but, on a way larger scale. I LOVE Arlington Highlands, which the Southlake Town Square reminds me of, but, it is built by the mall, not on the town square. This one in Southlake is the actual town square, where the police department and public library are – but, it was built up like Arlington Highlands with a movie theater, Starbucks and large nationwide business all mixed in with local businesses, like Spa On The Square. The Spa is on the 2nd level, so it’s already giving you a feeling of being tucked away and retreat-like. Not like some places where people are walking in off of a sidewalk with the glass door opening every few minutes with a bell ringing. 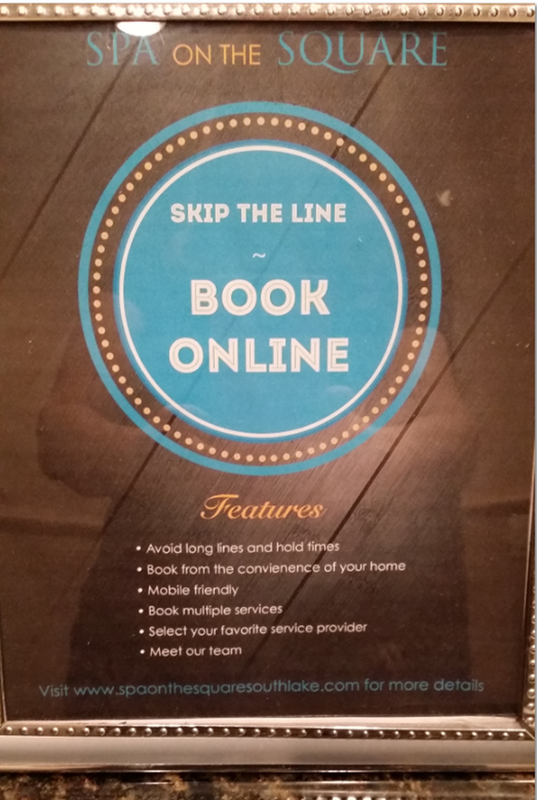 This is much more upscale, and relaxing when you first walk in and then the hometown vibe comes into play when you meet the very friendly and attentive upbeat staff! From the receptionist to Spa Director to the specialists at each station they were making sure our every need was met and that we felt completely comfortable and relaxed. 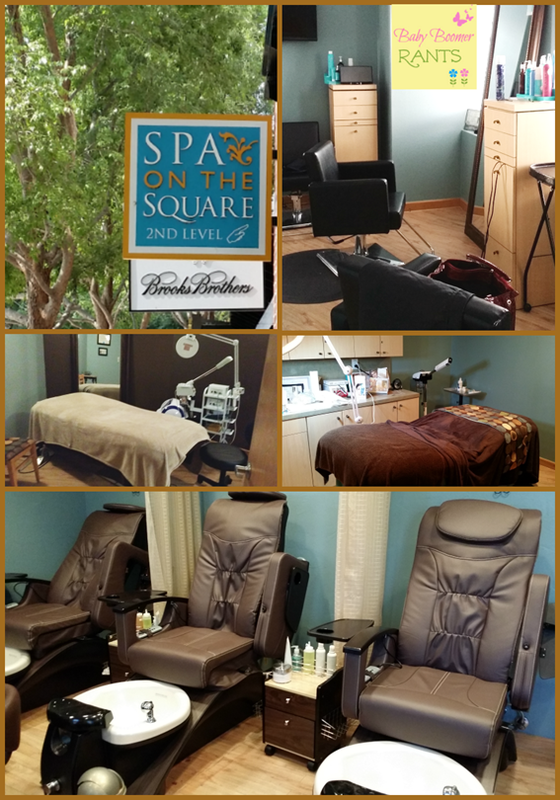 The Spa offers everything from hair and nail services to microderm facials, massage and makeup application. Everyone was very professional and explained what they were doing at every step and what to do between visits. They pampered us all! I cannot tell you how great the massage I got was, she was fantastic. I have one spot in my back that bothers me (probably due to my computer time) and she hit it the second she touched my back and focused on it and I can really feel a difference. I also had never had microderm facial before, I really always thought it involved a peel or something, but, it was basically a small vacuum type device that “sucked up” all of the dead skin cells on my face and wow! I was shocked at how my skin looked and felt afterward. All in all I think all of the bloggers in attendance had a great evening! 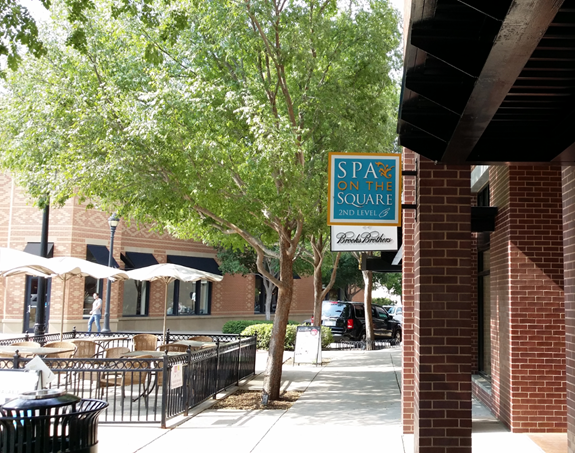 If you’re looking for a nice relaxing spa day – check out Spa On The Square in Southlake – you can’t go wrong! 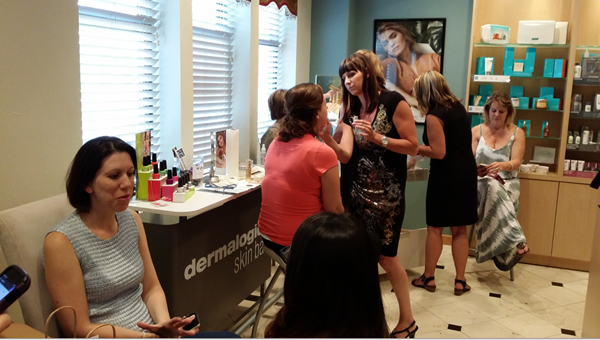 Right now, through the month of August you can get 20% off when you mention: BLOGGER NIGHT when you make your appointment! There’s also a great Groupon available right now that you can get for Spa On The Square! 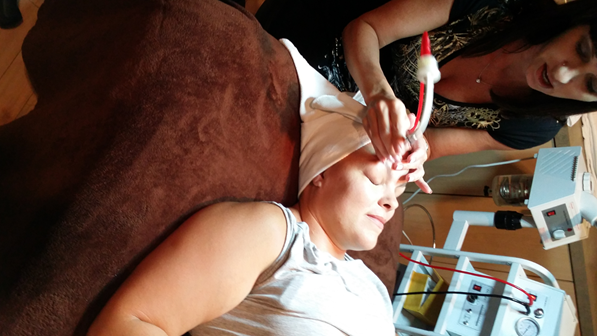 During each session, a laser showers the skin with intense pulses of focused light. The treatment is designed to diminish sun damage, fine lines, acne scarring, and areas of uneven pigmentation. 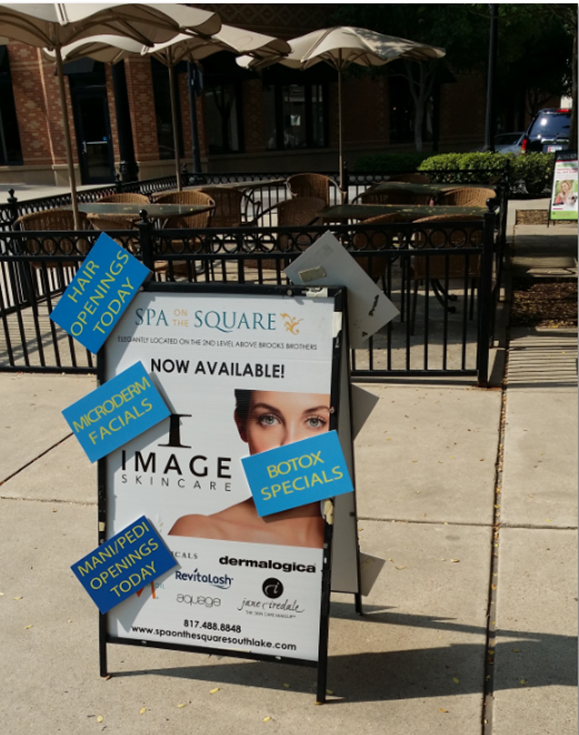 Very nice post on Spa on the Square – they will be very delighted. It was nice meeting you there too. Thanks for putting this together! I had a great time!